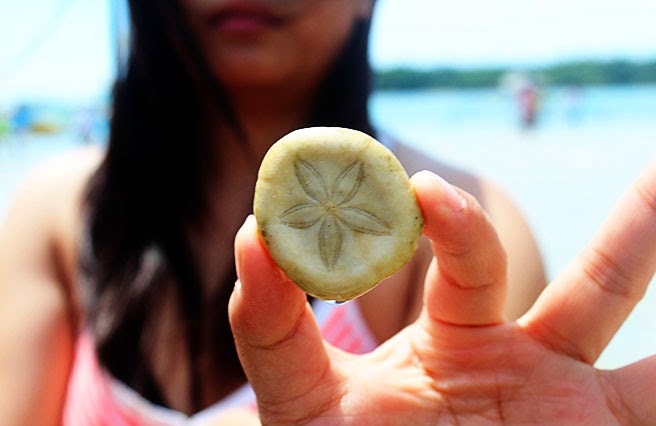 This is part two of my blog post Caramoan Island, Camarines Sur. 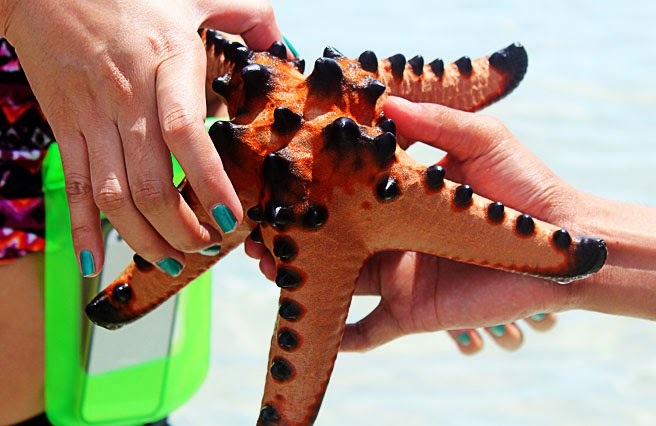 On our second day, we visited Manlawi Sandbar beach, Bugtong sandbar, Soledad Island, Bag-ing beach/Sabitang Laya, and Our Lady of Peace Monument. Our island hopping for day two started early. Our tour guide told us that most of the islands that we are going to visit will take longer travel time than we had on our first day, so we needed to get up early that day. We headed again to Bikal port which is the jump off site to start our second day of island hopping. 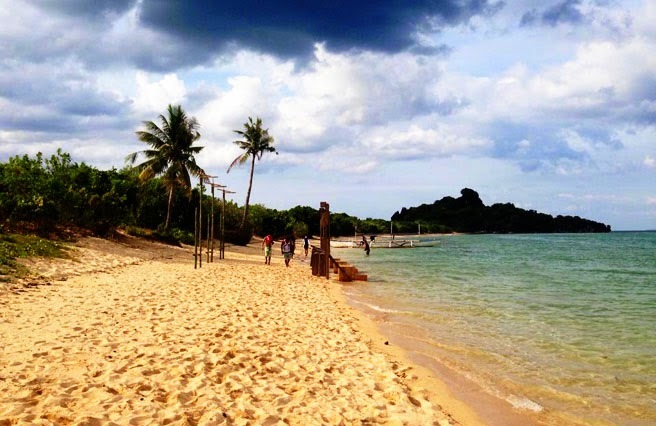 Manlawi Sandbar is popularly known for its vanishing sandbar. 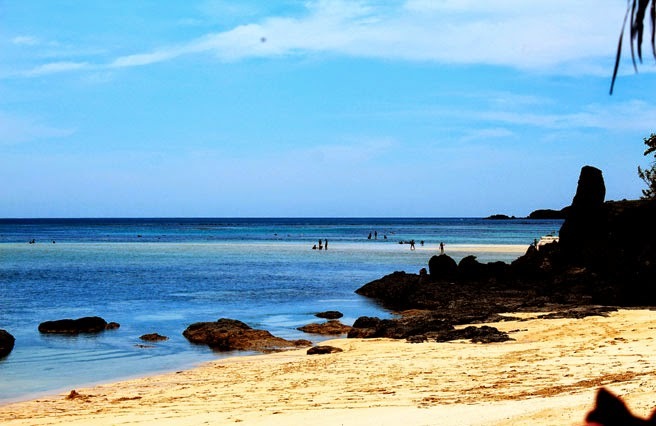 Sandbar is a ridge of sand in a river or sea, built up by the action of tides or currents, and it is often exposed at a low tide. 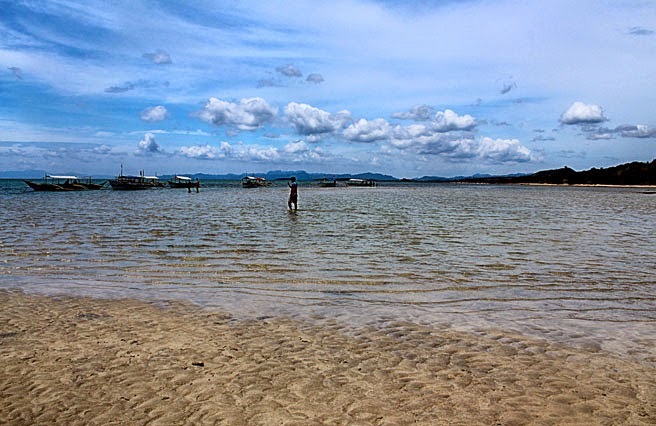 The sandbar in Manlawi can only be seen once the tide moves away, and we came here during high tide. 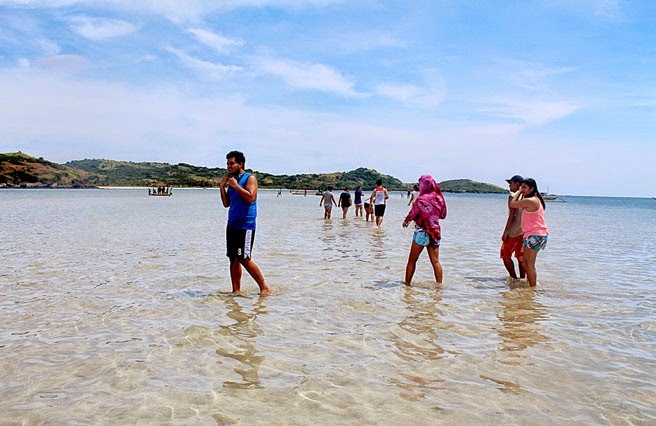 And according to our tour guide, the tide will completely recede only in the afternoon, so we could swim already on this place if we wanted to. But we didn't want to get wet yet that time, so we just took some pictures around while we were on the boat. 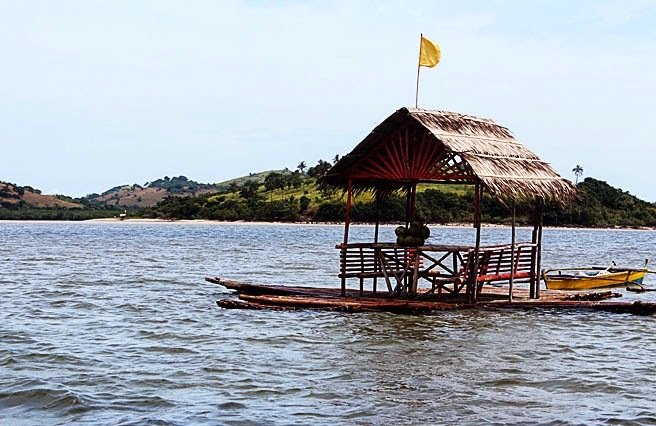 In here, you could rent floating cottages made of 'nipa' and bamboo, then take your lunch inside while enjoying the view. Definitely a perfect place to relax. 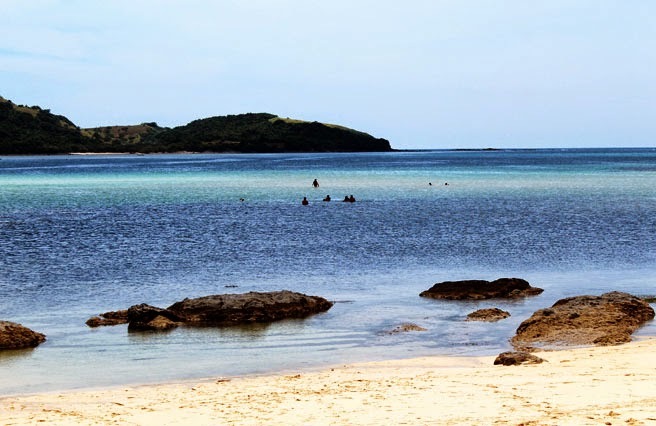 Unfortunately, we weren't able to completely see the widest sandbar in Manlawi. 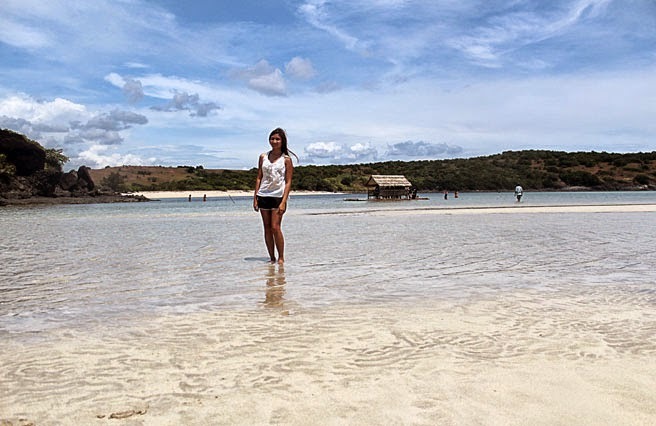 But our next stop offers also a beautiful sandbar beach. The tide was low when we arrived, and so trail of sands appeared in the middle of the sea, the view just looked more dazzling as we get down the boat. 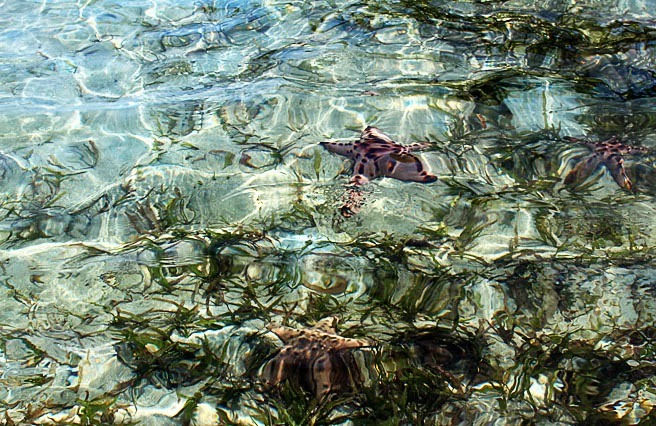 The water is spotless clear, and as we walked around the beach, we didn't find any stones or sharp corals. Sand is powdery white, fine, and compact. 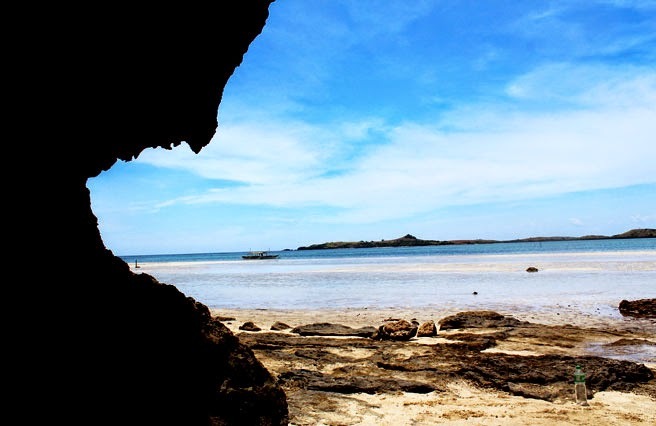 There is also a dark coralline limestone formation in one side of the island that makes it more attractive. This place is my personal favorite as the island is so pure, so clean, and so untouched. It is paradise :) You can relax here and find peace. 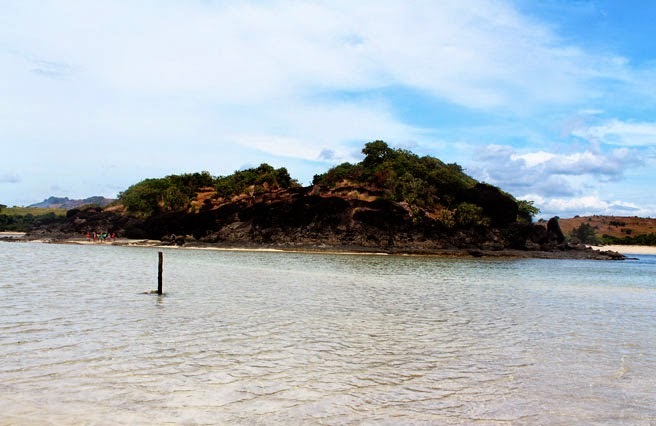 Then there are also cottages on this island just like in Manlawi, but then I think there were no available cottages at that time, so our tour guide just asked us if we just wanted to eat our lunch on the boat or in another island which is just across Bugtong beach. And we chose the other island. 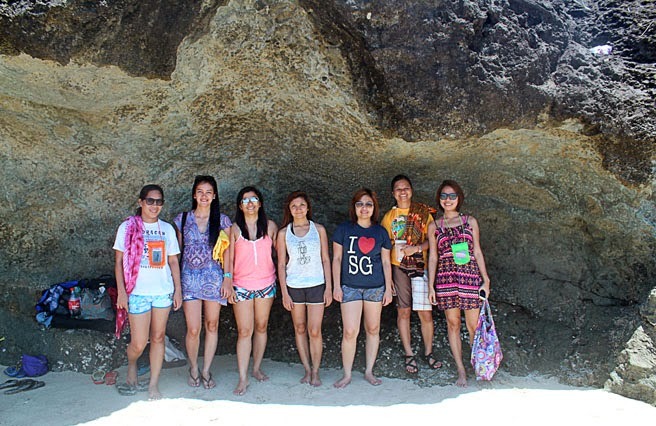 To reach Soledad, we walked passed through the coralline limestone formation from Bugtong island. 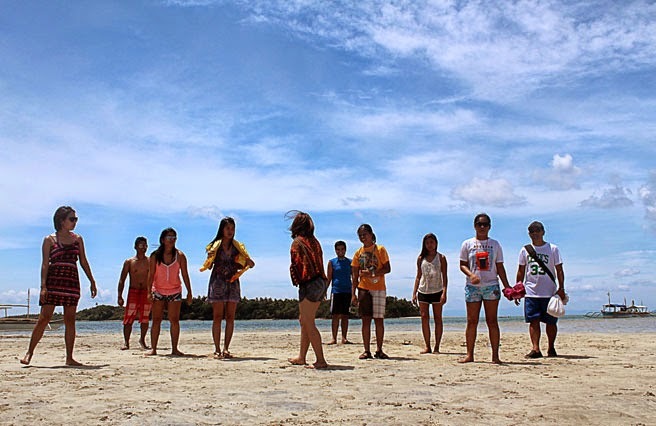 And as we walked, we noticed some 'kubos' situated on the island, and comfort rooms were also available. It indicate that there are people living on the area. There are also cottages on the area opposite the beach on which we had our lunch. I could say that we were in a right position as we witnessed a wonderful view while we were eating. We took much of the time here just relaxing, doing socials, and playing games. 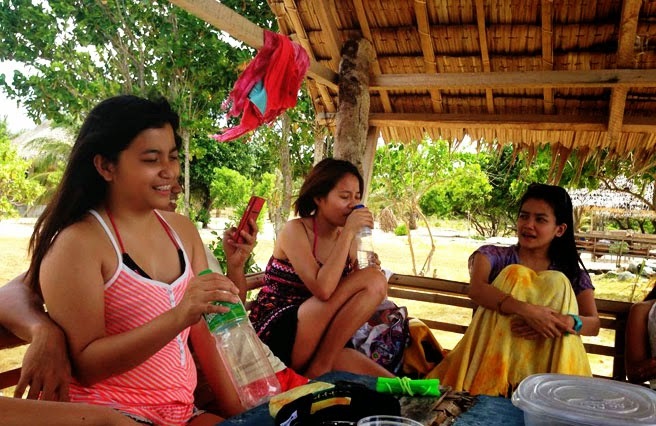 We weren't able to swim on the beach because of the scorching heat. 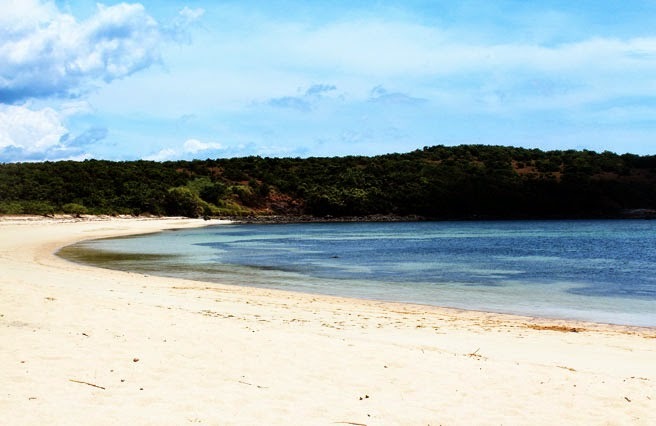 Bag-ing beach and Sabitang Laya are a two sided beach. And both beach has a long stretch of fine sand. 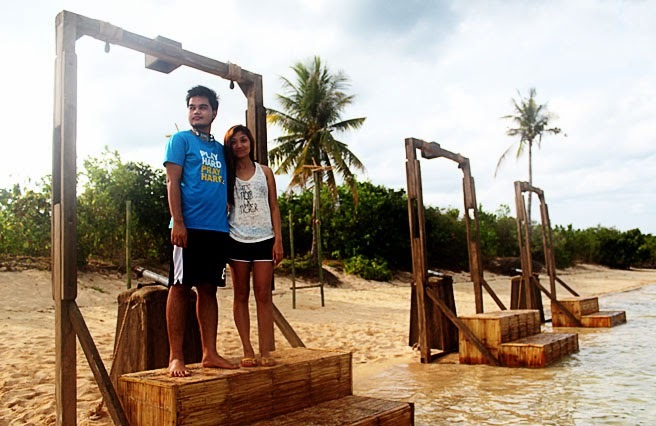 The unspoiled beach and beautiful sceneries at Bag-ing beach makes it as a hidden venue for many of the immunity and reward challenges of the reality show Survivor. Actually, when we arrived on the place, the equipment or items they uses on the show was still there. It is because there is still an ongoing shooting for the new season of Survivor. 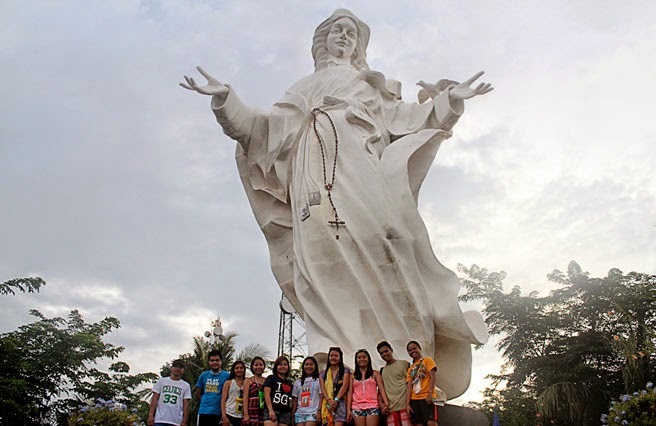 Our Lady of Peace Monument is located at Mt. 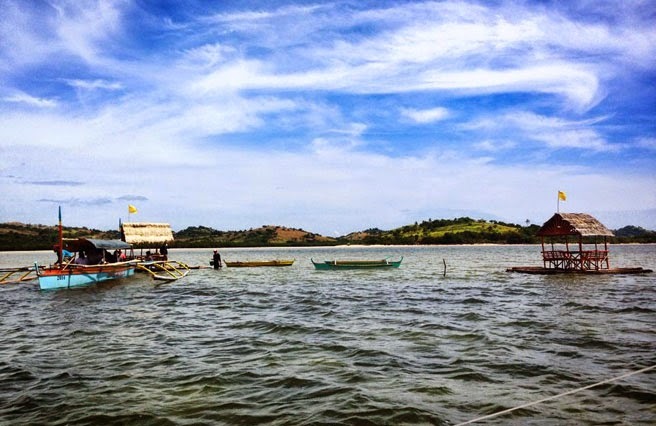 Caglago in Barangay Tabgon. 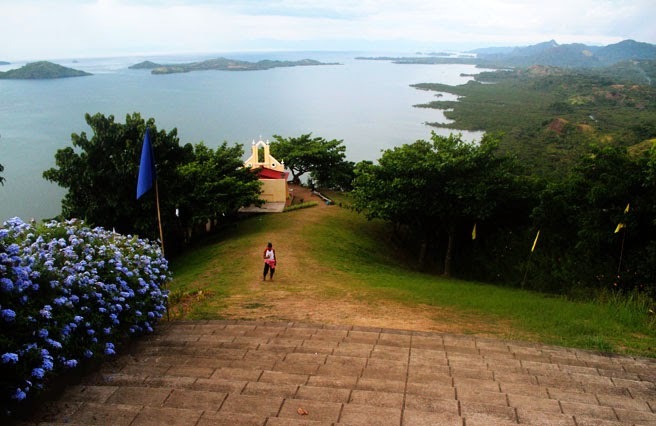 In here, you will be able to see the big white statue of the Blessed Virgin Mary which is the largest in the Philippines at 26 feet. 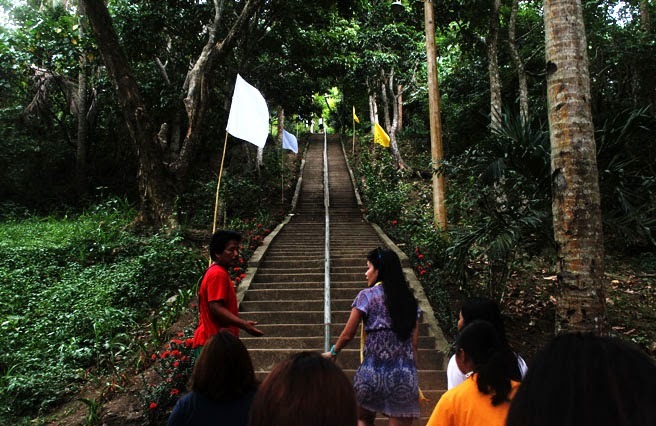 And for you to see this, you need to reach the top of the mountain by taking 500+ steps. 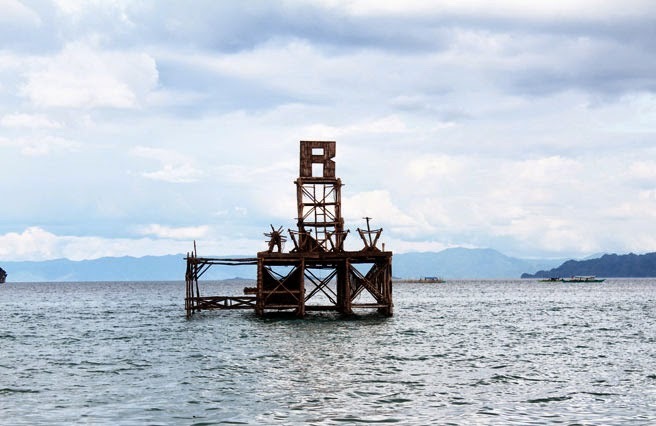 It was said that the original statue of the Virgin Mary was constructed in 1990, but one super typhoon has destroyed it which was struck by a lightning. And the new statue was fully restored in 2008. 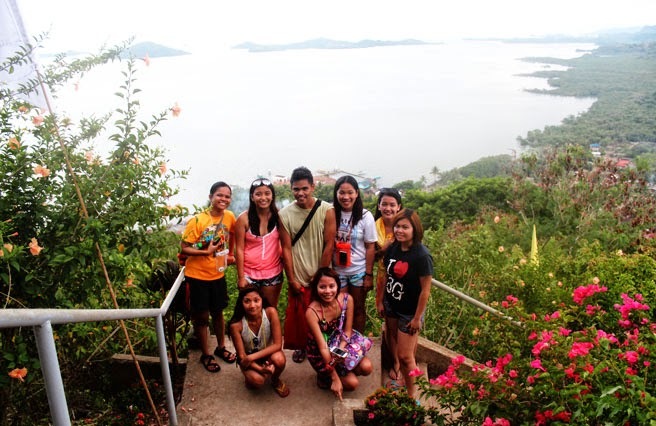 And that was our whole trip in Caramoan. 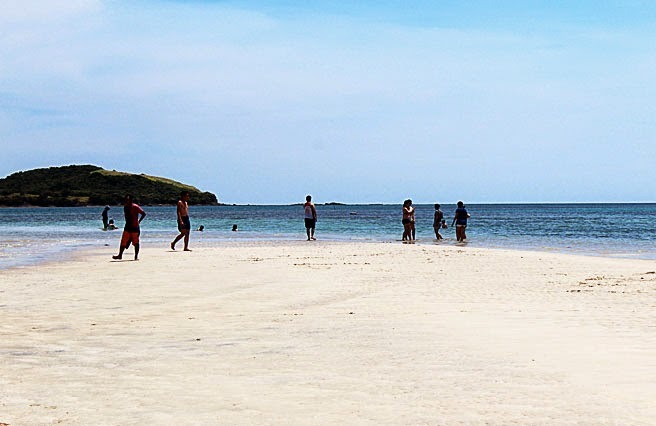 On the whole, Caramoan Island is an astounding place, particularly on many beaches it offers which has very fine white sand better than the well-known places like Boracay as they say. It is just quite challenging when you travel especially when going in and out of the boats. But it will all be worth it as soon as you see the place. 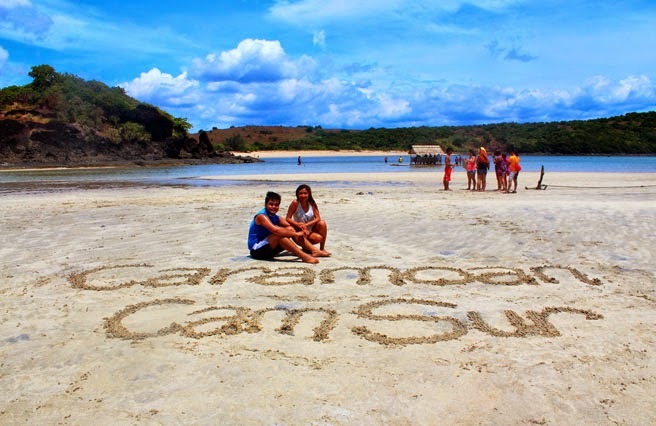 No doubt that Caramoan has now become famous in the international community. 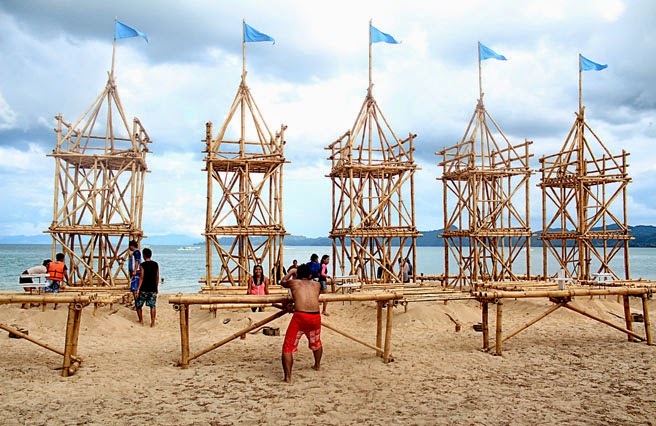 And hopefully we, Filipinos, could also visit, witness, and appreciate our own.